where x represents an unknown, and a, b, and c are constants with a not equal to 0. If a = 0, then the equation is linear, not quadratic. The constants a, b, and c are called the coefficients. While ‘c’ represents the constant term, b is the linear coefficient and ‘a’ the quadratic coefficient. The quadratic equations involve only one unknown and hence are called univariate. The quadratic equations are basically polynomial equations since they contain non-integral powers of x. Since the greatest power is two so they are second degree polynomial equations. We shall discuss the terms associated with quadratic equations here in brief as they have been discussed in detail in the coming sections. Discriminant of a Quadratic Equation: The discriminant of a quadratic equation is defined as the number D= b2-4ac and is determined form the coefficients of the equation ax2+bx+c =0. The discriminant reveals the nature of roots an equation has. The below table lists the different types of roots associated with the values of determinant. Example: Consider the quadratic equation y = 3x2+9x+5. Find its discriminant. Solution: The given quadratic equation is y = 3x2+9x+5. The formula of discriminant is D = b2-4ac. D = 92-4.3.5 = 31. You may refer the Sample Papers to get an idea about the types of questions asked. where a, b, . . . , r and s are constants. The largest exponent of x appearing in a non-zero term of a polynomial is called the degree of that polynomial. Consider the equation 3x+1 = 0. The equation has degree 1 as the largest power of x that appears in the equation is 1. Such equations are called linear equations. x2 +x-3 = 0 has degree 2 since this is the largest power of x. such degree 2 equations are called quadratic equations or simply quadratics. Degree 3 equations like x3+2x2-4=0 are called cubic. A polynomial equation of degree n has n roots, but some of them may be multiple roots. For example, consider x3- 9x2+24x-16 =0. It is clearly a polynomial of degree 3 and so will have three roots. The equation can be factored as (x-1) (x-4) (x-4) =0. Hence, this implies that the roots of the equation are x=1, x=4, x=4. Hence, the root x=4 is repeated. This is a very famous rule that helps in getting an idea about the roots of a polynomial equation. The rule states that the number of positive real roots of Pn(x) = 0 cannot be more than the number of sign changes. Similarly, the number of negative roots cannot be more than the number of sign changes in Pn(-x). For instance, consider the equation P5(x) = x5+2x4-x3+x2-x+2 = 0. Hence, it can have only one negative real root. Remark: The Descarte’s rule only gives an idea about the maximum number of positive or negative real roots but cannot give the exact number. For getting an idea on the exact number of roots, the Sturm’s Theorem should be used. This theorem states that the number of real roots of the equation f(x) = 0 at [a, b] equals the difference between the number of sign changes in the Sturm sequence at x = a and x= b, provided that f (a) ≠ 0 and f (b) ≠ 0. No. of complex roots = n - no. of real roots, where a real root of multiplicity r is to be counted r times. In case, the coefficient of the polynomial are real, the complex roots are α ± iβ and hence total no of complex roots are even. Here we shall discuss an example to explain this method, for theory you can refer the coming sections. Consider the question (x-3) (x-4)2 (x-5)3 = 0. By equating all terms equal to zero, we obtain various values of x which are called the critical points. Hence, here 3, 4, 5 are the critical points. Now plot these points on a number line in increasing order. Once you plot the points, put a value greater than the rightmost point in the entire function. Here, the rightmost point is 5. So put a value greater than 5, say 6 in the entire function. 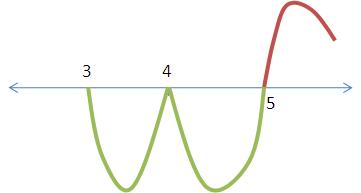 On putting x=6 in the entire function we get a positive sign so we start drawing the curve above the number line. Now comes the important step. Check for the exponents of each term. 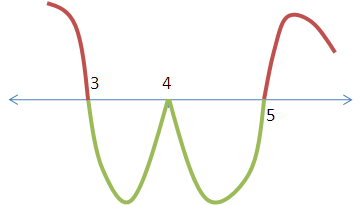 If the power of the factor is odd, you must change the side of the wavy curve ( if above then below and vice versa. Otherwise, you must continue with the same side of the number line. We explain this step for this example:First on putting the value 6 we get a positive sign so draw the curve on the above side of axis. Next factor is (x-3). So its power is 1, again odd. Again change the side of the curve. Initially, it was below, now it will be above the line. Hence this is how the curve looks like. It is clear that the function is positive in the intervals when the curve lies above the axis and negative in the intervals where the curve lies below the axis. 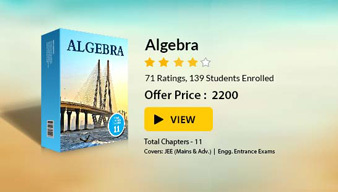 To read more, Buy study materials of Quadratic Equation comprising study notes, revision notes, video lectures, previous year solved questions etc. Also browse for more study materials on Mathematics here.